Keith Dubas, an architect, has lived next to Hazel Abel Park in the Near South Neighborhood for nearly 20 years. Amanda Huckins (center) talks with members of the bands Leggy, Trextasy and Bien Fang before their show in early February at The Commons, a community-supported experiment for volunteers, performers, workers and just generally creative types. Students at St. Mary's Catholic School, where 65 percent of students get free or reduced price lunch, play during recess in late November 2016. 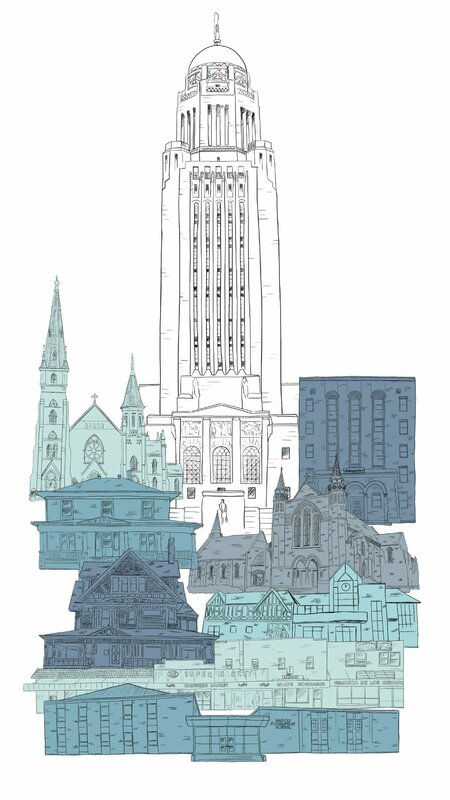 We want to tell the stories of the people who live, work and go to school in our Nebraska Capitol neighborhoods. Today we’ll tell you about Amanda, who started a neighborhood center, and Nicholas, a seventh-grader who thinks he already knows his life’s purpose. In the next weeks and months, we will tell you about James, who came as a child with his brothers to Nebraska, seeking a new home and a better life, and suffered a tragedy that changed his future. And about Chris, a southwest area beat cop whose job it is to keep the peace in neighborhoods of constant motion. Hope lives in the shadow of this state’s Capitol. It resides in the blocks that surround its Capitol square and stretches into Lincoln’s most irregular neighborhoods -- Capitol View, Near South, Everett -- in the patchwork of dense urban housing, offices, lobbying firms, schools, churches, businesses. It occupies the starchy brick buildings, historic mansions, multi-story condos and low-rent roosts; sits on porches on humid midsummer’s eves and at bus stops on crisp winter mornings before the sun rises on the new day. It plants itself in the possibilities of undergraduates wired to laptops and iPads at coffeehouses, in the barely conscious whose TVs run on in the background. In the kids kicking soccer balls in apartment parking lots, and immigrants waiting in food lines for melons and grapes and potatoes. It lives within the people who live in the shadow, those headed somewhere, or even nowhere. Keith Dubas, a semi-retired, well-traveled architect, lives with his cats in the Near South neighborhood. He's lived there 20 years and owns his building, renting the other units. The woman who lives above him has been there 17 years, the woman in the attic apartment seven, and the man in the basement also seven. His neighborhood has thousands of rental units, and he doesn't get to know a lot of those people. But Dubas loves the streetscapes where he lives, and the noble trees. And he sometimes takes in the cats abandoned by renters who come and go. Ninety to 95 percent of people who live near the Capitol rent or lease: large houses converted to apartments; multiplex brick buildings; and historic homes. Mostly, those apartments are affordable, if sometimes substandard. And it’s a good fit for people who like to walk, be close to downtown entertainment and jobs, and to be within reach of like-minded souls. Amanda Huckins, 29, who rents an apartment in the corner of the Near South and abutting the Everett neighborhood, works as a paraeducator at nearby Prescott Elementary. She relates to that diversity of college students, retired professionals, new immigrants, families, singles, artists, musicians, refugees, affluent and low-income. For every person with problems or unmet needs in her space, they also have a lot to offer, she said. “And I believe that of every person in this community." The neighborhoods have the largest portion of college students and residents under 35, compared to the rest of the city. Residents directly to the east of the Capitol have less education and triple Lincoln’s rate of unemployment. The three neighborhoods have some of the highest poverty rates, from 44 percent to 46 percent, according to the 2015 Lincoln Vital Signs report. Lincoln's average poverty rate is 16.5 percent. At McPhee Elementary School, across the street from the Capitol’s south side, 91 percent of students qualify for free or reduced lunch. At Everett Elementary, down the street at 11th and C streets, 92 percent participate in the program. And across the street to the Capitol's north at St. Mary’s School, 65 percent of students get free or reduced price lunch. And at all three schools, minorities -- Latinos, Asians, African Americans -- are together the majority of students. But it’s not the statistics that define the neighborhoods, it’s the people. It's Garry DeFreece, who grew up at the Beatrice State Development Center and came out as a young adult to build a life, with a career in carpentry. And then with fused fingers from a birth deformity, taught himself to do intricate and detailed pencil drawings. And it's Henry from Taiwan, a Fulbright scholar who joined a children's Bible study group one summer on the porch of Bill and Marcia Thornton's Kids at the Well, coloring with the kids so he could practice his English skills. It's their troubles, their successes and courage, how they use resourcefulness to meet their challenges. It's their stories that define the character in the shadow of the Capitol. Early in her campaign to become a senator representing the south Lincoln District 28, Patty Pansing Brooks knocked on doors near the Capitol. She thought she knew her district and its more affluent areas of Lincoln: Piedmont, Country Club, Taylor Meadows. But she didn’t know much about the Capitol area where 49 senators gathered half the year to exchange ideas, debate bills and craft laws. She found poverty behind some of those doors. She discovered that what they need is what most people need statewide -- jobs, economic confidence, housing assistance, prison reform, quality health care for themselves and their kids. It became the heart of the job she would take on. "We have this glorious building offering hope and help via policy and legislation,” she said. “But then we look around us and see the true need of people who are really hurting. "These people want to be heard. They want to matter to all of us," she said. Many of the people who live in blocks around the Capitol will tell you the senators don’t know much about their needs. And many, they believe, don’t really care. But some are learning, especially those who buy or lease condos or apartments and become, at least temporarily, a part of their community. Sen. John Kuehn’s hometown of Heartwell is a two-hour drive. So from January to June, he lives two blocks from his elective workplace. There’s a disconnect, he knows, between those who spend long days inside the Capitol and the surrounding community. But what he sees and the people he encounters on his short walks each morning and evening filter and factor into his work there on bills and on shaping the state budget as a member of the Appropriations Committee. Because he passes a bus stop each day where people wait, in the cold or hot Nebraska weather, he has approached public transportation funding issues differently, he said. Sen. Dan Hughes farms out west near Venango, and he likes those wide open spaces and small towns with populations that are way less than even the schools around the Capitol. Venango has about 162 residents. His closest neighbor is a half-mile away. It’s 20 miles to the nearest grocery store. But here he is now, living three blocks from the Capitol, his first foray into big city living, and into understanding the urbanites in this neighborhood. Kids who are living in broken homes with not enough to eat, they break his heart. Especially as a farmer who raises wheat, corn, millet, pinto beans, field peas. But he still believes there are opportunities available to nearly everyone if they’re willing to take a risk. “Reward does not come without risk,” he said. What would the people who live in the shadow of the Capitol ask for if they could be so bold? They would ask for more help for homeless people, and more mental health services and treatment for people addicted to alcohol or drugs. They would ask senators to think about the people who have no other home but the Beatrice State Developmental Center and to not close its doors. They want better regulation of absentee landlords and fewer people going to prison when what they need is drug treatment or jobs or better guidance before they commit crimes. And they need services like early childhood education. And better housing, and health insurance for people who can’t get it, and good transportation and roads. They can’t really say they are expecting those things. But that’s what they would ask for. A number of church buildings, and their congregants who come and go, are scattered within close view of the Capitol. And some of them get to know the community well. Jeff Heerspink believes he knows what the people who live near the Capitol could use. “It’s easy to hand out a box of food, but it’s much harder to walk alongside of some of the people in this neighborhood,” he said. As the minister at the F Street Neighborhood Church, he has seen broken and tragic lives, and loneliness. “My answer to that question is always, just love,” Heerspink said. “It’s the simplest answer but it’s the most difficult thing to do. "People loving each other is what’s going to make the difference."